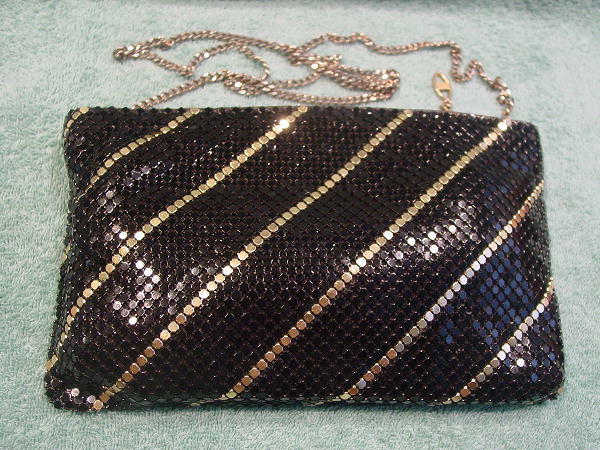 This black metal mesh evening purse has a diagonal bright gold-tone accent design. 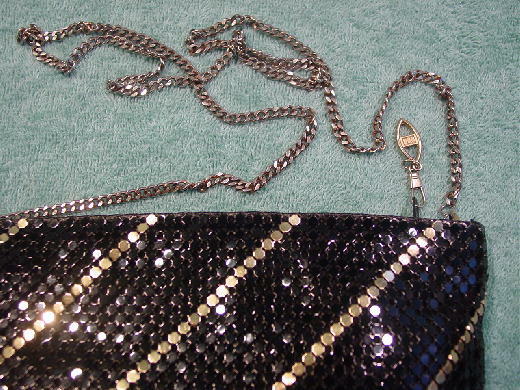 It has a 39" long gold-tone (not as bright as the accent design) necklace chain shoulder strap. There is a tone-on-tone side to side zipper closure with a gold-tone pull. The black fabric lining has a slight padding between it and the metal mesh. There is also an open interior compartment. The mesh hangs freely on the sides and bottom from the lining. The light spots on the mesh are just reflections. She wore this purse for two seasons (when she went out at night) while modeling in Europe. She picked it up in a boutique in New York.